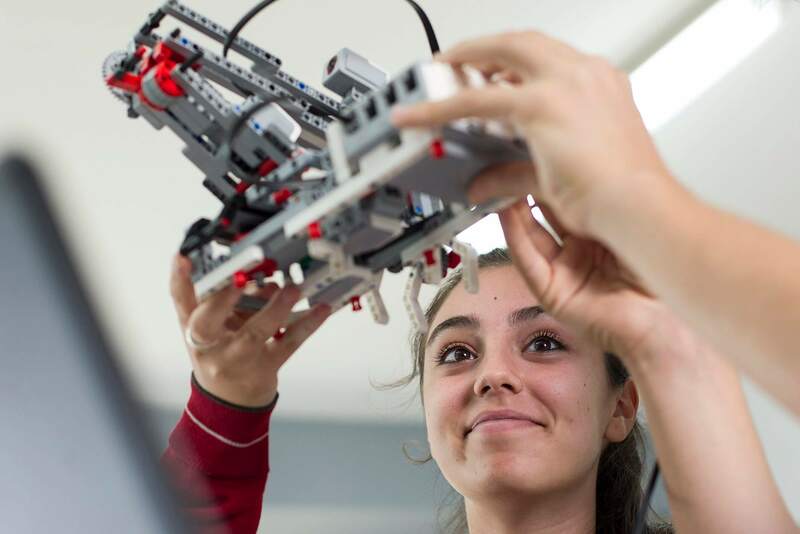 El Pinar is the first school in Andalucía to implement robotics construction and programming in subjects as Sciences, Physics, Mathematics, Technology and Plastic. Under the motto of ‘Learning by Doing’, students aged from 3 to 17 will have the opportunity to study some of the subjects considered ‘boring’ in a creative, practical and innovative way. This revolutionary pedagogical model, far from being easy, is being very succesful in some schools in Catalunia, Madrid, and Valencia. When the educational robotics began as an educational work proposal, it was described by some experts as a visionary project. Nowadays, its efficiency is proven by all types of investigations in applied pedagogy, as well as by the experience of professionals in Educational Achievement leading countries. The study of Robotics as a extracurricular activity has significantly increased all over the country. However, few academic institutions have decided to implement it in their curriculum. El Colegio El Pinar goes one step forward, and becomes part of the reduced group of centers integrating robotics into their curriculum as a teaching tool for learning science subjects, located in the communities of Madrid, Barcelona and Valencia; being the first one in Andalucía. With this approach, our School of robotics – pioneer at regional level – will make the lessons of Physics, Mathematics, Technology, Sciences and even Plastics Arts look more interesting as the practice exercises include robotic construction with different levels of complexity that will help our students mastering the required competences and making the best use of the concept of ‘learning by doing’. This particular vision of the work in the classroom is directly linked to psycho-cognitive studies on patterns of knowledge acquisition by humans. It should be noted as well, that according to Dale’s pyramid DALE, we remember 10% of what we read, 20% of what we hear, 70 % of what we repeat, and 90 % of what we build. Withing the specific projects there will be challenges that students must overcome working in a team, and ‘mistakes’ will be considered as an active part of the learning process. This project is not limited to the stages of ‘Primaria’, ‘Secundaria’ and ‘Bachillerato’. This is another challenge for our teaching staff: implementating this project in the nursery classes, so children will start a familiarization that will be reduced and adapted to robotics programming through the years. The goal is that children aged between 3 and 17 years will have the opportunity to make a full use of these incredible tools to carry out experiments and exercises to solve problems of day-to-day life. We would like to promote an entrepreneurial actitude among students, understood as their ability to analyze the present and adapt to the environment. Some of the main contributions of this educational projects is ‘collaboration between colleagues’. Its work methodology is based on the creation of teams with defined roles, where each component has specific functions, and these roles rotate so that each student will get to know from inside every role, while developing their skills to work in group. Along with construction, the other major topic of Robotics is programming. The machines the children will be working with -from Lego pieces toArduino- are run by small digital ‘brains’ whose orders must be designed and recorded by the students themselves, using specific applications on their laptops. In these technological times, where almost any action is computerized, programming is an essential skill to have. In this sense, robotics offers students the necessary tools to begin a familiarization and later, acquire the knowledge that will help them to confront with solvency their professional activity.